My first terrain...and hills look terrible! ► My first terrain...and hills look terrible! after having watched lot of tutorials from geekatplay and youtubr, I decided it was time to me to build something from scratch in WM: some soft (but ridged on top and nicely carved) coastal hills and a small pluvial valley underneath. I've studied like a mad. I'm ready to do that, I told myself. First of all, I think my network is damned complex for such simple layout. Perhaps some uneeded nodes? Hills seems a bit up too rough to me, but if i power-up the erosion nodes, they goes disrupting and ending up in flatland. At the end of the day, I was not able to soften them (in the valley-midland range) without loosing them. The valley is way too large and make the terrain uninteresting. Perhaps I made a mistake in the Terrace or the Expander node, or in the Perlin generator? Finally, the erosion. It leaves a weird set grain/spikes I was not able to control, and a sediment collapsion just below the higher ridges. It looks weird when applying a simple texture overlay. tnx in advance for any support! Re: My first terrain...and hills look terrible! I think you're being very over-critical of your terrain! It's certainly not terrible looking at all; there are many places on earth that look very much like that. 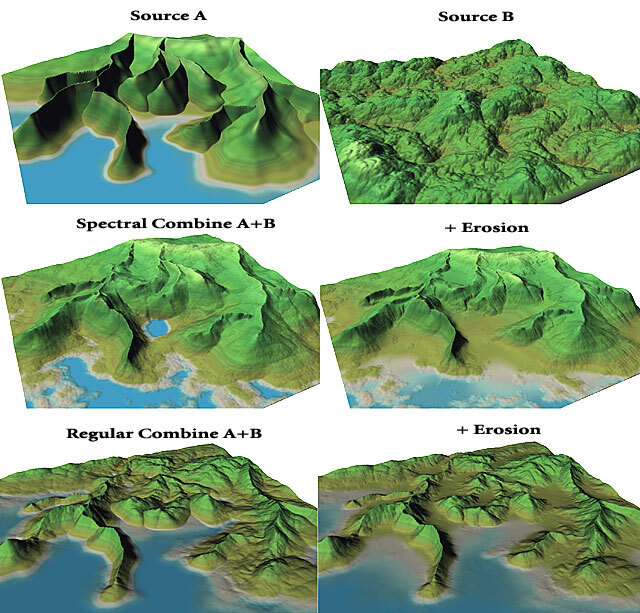 If you're specifically trying to create Hawaii-style ridgelines, they are a very unique look that can be challenging to replicate -- indeed, they'd be labelled as unrealistic in many locales! -- so I wouldn't be worried that you're having difficulties. 2) If you're trying to replicate the generic feel without a specific source image in mind, then try breaking down the components of the scene, keeping in mind that what you're creating won't match the reference -- but hopefully will match the feel of it. I've attached an example world where I"ve tried to replicate those three features above. Ridged perlin provides the basic terrain; channeled erosion and thermal erosion create the basic ridge and gulley network, which has been further emphasized by carving away a blurred flow map from the terrain. Finally, the lower valley area is blurred to produce the soft hills of the lowlands. This may or may not be representative of what you want, but hopefully it at least gives you some ideas about how to approach creating a thematic terrain! I couldn't find the article the image is from though.